I was impressed with all the details or getting ready for school and subject for teaching. It came across like a lot of extra time put in the book. It made the Character of Sheridan Hendley come alive for me. This was a charming novel that I really enjoyed reading. The plot is intricate, but understandable. There is definitely substance to the work. It is academic without being stuffy. (I don’t know about you, but I appreciate that a lot.) The writing flows very well, making the story enjoyable. I enjoyed the romance aspect of this mystery. This is a great summer read. It’s a fast read that explores the sometimes tangled relationships that exist in academia. This cozy was a good one. In fact, it was great! I enjoyed it and didn’t want to stop reading. Sheridan Hendley is a professor and psychologist, not a sleuth. When her colleague at Cold Creek College, Adam Millberg, is murdered, she is charged with helping the Detective assigned to the case. Immediately, her good friend becomes the prime suspect and Sheridan is motivated to help solve the case and prove Kim isn’t guilty. It also becomes apparent that Sheridan is attracted to the handsome Detective. As Sheridan tries to implement the crisis plan on campus and connect all the people in Adam’s life, she finds that many women have a motive for Adam’s murder. Slashed tires are the first indication that Sheridan’s involvement is obviously making someone nervous. Christa Nardi is and always has been an avid reader. 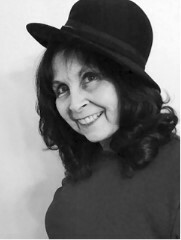 Her favorite authors have shifted from Carolyn Keene and Earl Stanley Gardner to more contemporary mystery/crime authors over time, but mystery/crime along with romance are her preferred choices for leisure reading. Christa also has been a long time writer from poetry and short stories growing up to technical, research, and nonfiction in her professional life. 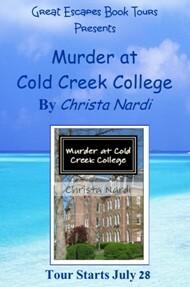 With Murder at Cold Creek College, Christa is joining many other reader/writers in writing one genre she enjoys reading – the cozy mystery. 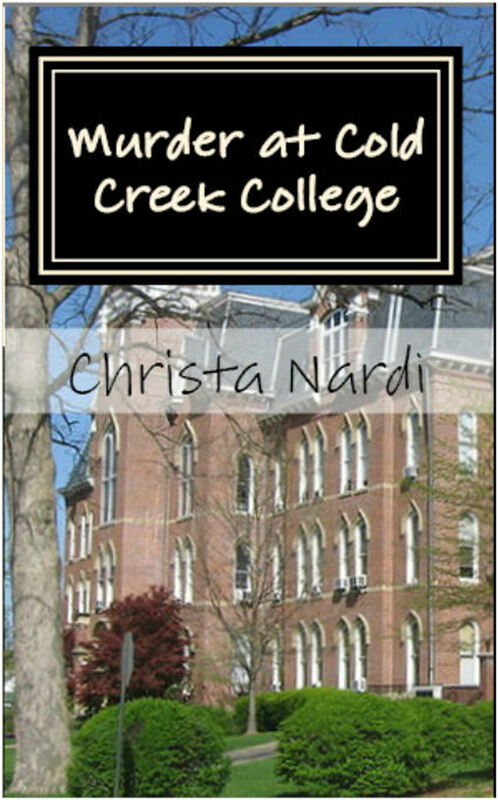 Christa Nardi is a pen name for a real life professor/psychologist from the Northeast. I knocked on the now closed door. Through the window in the door, I could tell he had two students in there with him. One of them opened the door, and Max bellowed, “How dare you interrupt me! This is an important meeting regarding my research! Whatever you want will just have to wait.” He then turned and signaled to the student to close the door, but the detective managed to slip his arm around me and blocked the door from closing. I slid over and out of the way, but not before I noticed that he smelled good. His arm had been warm as it moved past my shoulder. The brief contact aroused feelings I hadn’t felt in some time. “Mr. Bentler, this will not wait,” stated the detective with emphasis. His jaw tensed and his back seemed to straighten if that was even possible. “It is DOCTOR Bentler, I’ll have you know. And I have important work going on here,” Max stated in his usual emphatic tone. “Dr. Bentler, then. I am DETECTIVE McMann with the State Police, and I don’t really care how important your work is. I need a few minutes of your time and of theirs as well.” His tone did not brook any argument or sway from my perspective. “Dr. Bentler, we will speak now. If you decline to speak now, I will consider obstruction of justice charges. Do you get my point, SIR?” the detective added as he stepped a bit closer to Max, who immediately sat back down. It would have been somewhat comical if not for the seriousness of the situation or the two students sitting there, now looking quite terrified. “Janet, Wesley, why don’t you come out in the hall with me for a few minutes? 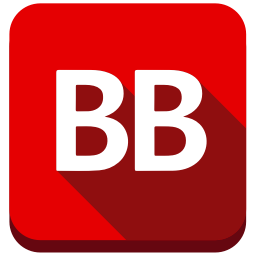 Let the Detective here speak with Dr. Bentler for a few minutes,” I suggested with a quick glance to the detective. The detective moved slightly to allow them out, and stated more softly, “Please do not discuss the situation or allow Mr. Janis to speak with them” as he closed the door. The three of us, and Joe, stood in the hall. The two students still looked terrified, and muttered about how mad Dr. Bentler was going to be with the delay. They were both seniors and Max was their thesis advisor. It was pretty clear that they were intimidated by him and his blustering manners. Sometimes it seemed that Max pushed the envelope with the students, but we each had our own style and he was more bluster than bite. As we stood in the hall, at least once I heard Max’s voice raised in indignation. I imagined he was being his usual arrogant and hot-tempered self. His voice got so loud at one point that Janet blanched. I suggested to the two students they might want to have a seat in the break room. I wasn’t even sure they knew anything had happened or why a detective was here and would be questioning them. The break room was catty-corner from Max’s office, and they could at least sit down while they waited. And maybe not hear Max. Joe asked me if McMann had told me anything, and I just shook my head to the negative. Joe and Terra were good people. I liked them, especially Terra who sometimes made me laugh. The door opened and McMann came out, looked in my direction, and I pointed to the break room. He went in there, and closed the door. He still looked a bit irritated, but that is often the case after an interaction with Max. Max shut his door forcefully with a scowl on his face without saying a work to Joe or me. Joe and I just waited. I hoped the detective would be a bit more subdued with Janet and Wesley. I love trying put first books in a series! Thanks for the giveaway chance.